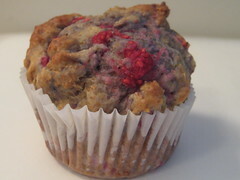 I love a lower fat muffin that keeps the flavor but not the fat. These look delicious and moist and, of course, totally flavorful! I love my microplane zester. Since I picked one up, I’ve been getting and using lemons like they are going out of style. Could have fooled me…they look full fat! 🙂 They sound really good, and look absolutely tantalizing. Made these yesterday. Mine didn’t rise that much as in the pic. I give them a 3 on a scale of 0-5 in the taste category. The lemon was a nice touch.